But I did not get a permit this year, a keep , permit. I could still catch and release , I just cant justify that . Anyway I would guess the fishing will peek this weekend if it already hasn't. We opted for bear last weekend this weekend I have commitments elsewhere. The back yard is all tour up making room to park the new boat and... There is the new boat , It takes up a LOT of my spare time. Still a ton of work to be done. Now that I work some nights I have every "DAY" off and I'm working harder now then when I worked. I'll pass up paddle fish , but shortly here I'd love to try to catch ( PUN ) the end of the cat fish and sturgeon run. That's a big one, D! 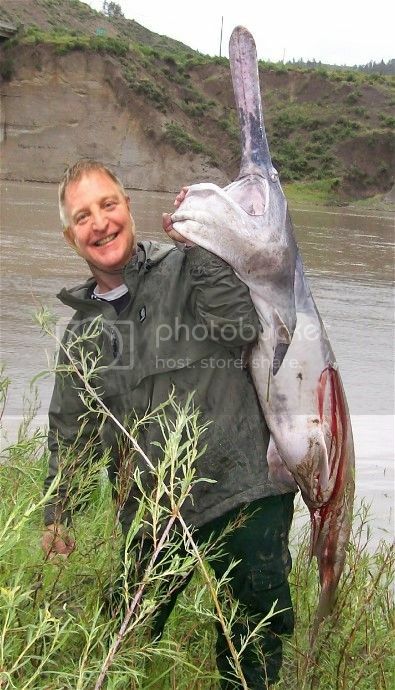 My biggest spoonbill was 40 pounds. I bet your sturgeon fishing is good, too. We catch a few here, usually accidentally while catfishing. Do you have a lot of flatheads ( my favorite) in MT? That paddle fish was got a year or two ago by a buddy it was 103 pounds. Channel Catfish is what we have here and we have a fair amount but in the spring is when there targeted and seam most active. Sturgeon, we can catch and keep shovelnose under 40" , pallid sturgeon are protected and we don't have any of the white sturgeon like on the west coast. 103 pounds! You grow fish big in Montana, D! We have tall corn, lots of mud and tornadoes, and mostly channel cats and flatheads. Of course, we have lots of tree squirrels, too. What's next to do, D? Working on the new boat port, working on the air boat, shooting prairie dogs, calling coyotes, and fishing , kinda in that order. "Hunting seasons " start again on September 1st. The grass gets to tall for gophers. How about you ? What keeps you busies in the summer. Still packing a badge and guns (issued M4 rifle and M9 pistol) while working the full time day job, working in the knife shop, some fishing, and waiting for hunting season to open around the 1st of Sept. I work my 4 10 hour shifts Mon.-Thurs. so that gives me a 4 day work week with 3 day weekends. I gave up my licensed PI work, not enough hours in the day. I still have my state license but would rather make knives in my spare time. I do miss the money, though. My boat motor needs a tune-up before I hit the river so I have been doing a little bank fishing. Boat is an old 18ft Coast Guard bow johnboat with an old but good 35HP Evenrude. Motor will idle down to just the right trolling speed for walleyes. I am going to my favorite gun store today to chat with my pals and get 4 boxes of .45 Blazer ammo. I have a stone instrument table to drop off to them. It weights several hundred pounds and is made of 3 slabs of granite or marble. I will have to draft my brother to help load it into my truck. I bought 4 or 5 of them years ago for just a few bucks and passed them around. I am donating the table to the shop owner. Then it's home and mowing, and back into my shop to finish one small game knife going to Indiana.